I miss the peace and quiet of the field and want to go birding, but so far I have only been able to watch the birds in the yard. And for the most part I was only able to take photographs from the porch, as it was not only too cold to go out during the extreme cold last week, but I also did not want to interfere at all with the birds that were relying on my food offering. The goldfinches are holding their own and even getting a little feisty. The day or two we have had brief but significant warm-ups, the birds must have gotten spring fever because judging from the full feeders they stayed out of the yard entirely. Tomorrow I am attending the 18th Annual Gull Frolic. I am curious to see the lake, which was quite frozen throughout the polar vortex and the aftermath, in addition to whatever gulls the frolic attracts. If past years are any indication, the worse the weather for humans, the better it will be for gulls. We shall see. Or downside up. I have a really good excuse for not managing a blog post until now, which I hope never to use again. As much as I hate the passive voice, I’d rather phrase it like this: my car was totaled Sunday night on the way home from a meeting – the accident was unavoidable, not my fault, and I am happy to report there were no injuries and I will be getting a new, safer (should I have to crash into anything again) vehicle shortly. It was 14 degrees Fahrenheit outside that night and I was so focused on getting the police to arrive that I forgot to take a picture of the damage, but that’s history now. So is the extraordinary lunar eclipse of that evening which I also forgot about in my distraction, although I was admiring the full moon through the window of the squad car as I sat in the back of it to keep warm while the police handled the investigation and report. So there are no spectacular images to share with this information, and I apologize. Instead here are some pictures from last weekend, when we got a total of about 9″ of snow, but had not yet plunged into the single digits and below which is where we are now. I don’t anticipate getting any clearer photographs this weekend, but I will still try to capture the two Dark-Eyed Juncos and the Black-Capped Chickadee that I have seen only briefly. It was nice to see cardinals hanging out in a relaxed fashion. I hope to be back soon, maybe even with a report about the new vehicle. In the meantime, I wish you all safety and warmth wherever you are! The American Goldfinches are late breeders, so I haven’t seen more than one or two around until this past week. They are now returning to the yard to take advantage of the thistle socks again, but they are also helping themselves to the seed-heads forming on the flowers. I don’t think it ever occurred to me before that just when I’m thinking the coneflowers are looking like it’s all over, it’s just beginning for the goldfinches. I watched this one male work on the “spent” flower he’s sitting on for so long I finally decided to take a video. And then there’s the thistle socks. The second photo was through the porch window so it’s fuzzy. The sunflower seed feeder is always popular with the House Finches and Northern Cardinals. I haven’t seen the skunks for about a week. I was hoping they were keeping the cat below, photographed under my neighbor’s deck, out of the yard. I have never seen her attack anything but I am not fooled by her innocent-looking lolling around licking herself on the back cement pad. The squirrels seem to be distracted from creating too much chaos by a steady supply of peanuts. There were not a lot of birds on Saturday’s first bird walk, and since they were difficult to see in the overcast I didn’t take many pictures, except in one or two cases just to confirm identification. So I’ll stay in the yard for this post. Below is an Agapostemon Sweat Bee gathering pollen. We’ve had so much rain alternating with hot, sunny days this season everything in the yard is growing out of control. My Big Bluestem is well-established and as tall as I am. I like the fringed look of its flowering. I haven’t done well with tomatoes for years, but I can grow peppers. This is the first time I’ve planted poblano chiles. They’re getting bigger. I’ll have to start cooking them soon. I really like the Mistflower and am glad I planted it in a shady spot between two trees where it’s filling in nicely. Below is a plant that introduced itself this year and up until a couple days ago, I didn’t know what it was. But I was reviewing the University of Illinois weed page looking for something else, and found its picture. I am happy to identify it as Toothed Spurge (poinsettia dentata). Although it has shown up uninvited, it is a native and rather attractive. The leaves are so thick they look almost like a succulent. I’m relieved it’s not an invasive, so I think I can let it hang out for the rest of the season. The Wild Senna on the left below is pretty much gone, but the Tall Ironweed is still blooming, although a lot of it has fallen over. In the front yard I discovered Nodding Onion which I think might be blooming well for the first time this year since it was planted by Art three or four or however many years ago it’s been now. And the one Cardinal Flower plant continues. I’d like to have more of it. Not sure I have a good red thumb though. More regular visitors, of course House Sparrows, but I thought this one was a rather attractive little guy. And the female Downy Woodpecker below, on the peanut feeder, looks like this might be her first year in the yard. One more of my too-hungry-to-be-camera-shy goldfinch. Saturday I “lead” the group on another bird walk, and I hope this time to see some migrants to write about. At last. It didn’t last long, but we had a beautiful weekend last week and the trees were excited and blooming and the birds were singing and courting and I was recovering by sitting still and watching it all. While I sat there I counted five White-Crowned Sparrows in the yard. That’s an all-time high. I am delighted that they considered my yard a stopover for at least week, on their way north to their breeding grounds. In particular, one male was singing loud and clear directly over me and as hard as I tried to get a video, I had too large a lens to capture his image with his song, but I did manage to record him on my cellphone which I was using to do a yard list on ebird. The neighbors’ dog was out in their yard and she was going crazy over any squirrel that appeared. The usual cast of characters included a Mourning Dove, an American Robin, and a few American Goldfinches. There was some serious courting going on with a couple House Finches. The Redbud is in full bloom. And it’s hard to find a spot in the yard that doesn’t have some wild violets blooming on it. My plan is to try to eradicate most of it today. Presently we have had cool, rainy weather, so it will be a muddy business to remove, but no more rain is predicted until later tonight, and this may be my last chance to remediate the landscape. I visited the Portage last Sunday to see how spring migration was unfolding there, and again yesterday to lead the first of my two bird walks donated to the Unity Temple auction. Both outings were full of birds and good times. I will be back with photos. My knee is not too happy about spending so much time negotiating uneven ground, but like physical therapy, in the end, I am regaining mobility. No pain, no gain. To be continued. How long does it take to stop hearing a piece like the Faure Requiem in one’s head? The powerful experience Sunday morning of singing the Requiem twice as a member of the Unity Temple Choir, after the anticipation of the event woke me up periodically the night before, not to mention the weeks of rehearsal: I guess I have been living the Requiem. In spite of the incessant rain we had an ample and appreciative audience. After services the rain stopped for a while, so I took a walk around my neighborhood to see what spring migrants, if any, were trapped by the cold north winds. Internally possessed by the music, birding allowed the music to go on playing in my head at full blast. So far I have gotten through yesterday and this morning with my usual distractions of Spanish and French on the phone and summoning Peter Mayer on my way into the office, but bits and pieces of the Requiem still haunt me. Yesterday with the Kyrie it occurred to me that I caused conversations to be held in D minor. Here’s a little roundup of two weekends in the yard and environs. I struggle with how long I can endure the cold, and the birds struggle with deciding when their hunger overcomes their inability to ignore my presence. More Yellow-Bellied Sapsuckers in the conifers around the edge of Freedom Park which is just at the end of my block. The rain changed to snow overnight. Again. It’s as if there was a repeat sign at the end of last weekend. While I am still thankful for my undisturbed leaf litter cradling the new green shoots that seem to be emerging from the soil nevertheless, the greenery is beginning to look tired and frozen. The snow shots are from last weekend when unfortunately I had to take them through the porch windows. The mourning doves are in full courtship mode, in spite of the chill. Dark-Eyed Juncos have been a force, and it’s delightful to hear them sing on occasion. I love the subtlety of their individual variations in plumage. Last Sunday I was surprised to discover an Oregon Dark-Eyed Junco in the yard. There are six subspecies of Dark-Eyed Junco, and the one we get consistently is the Slate-Colored. 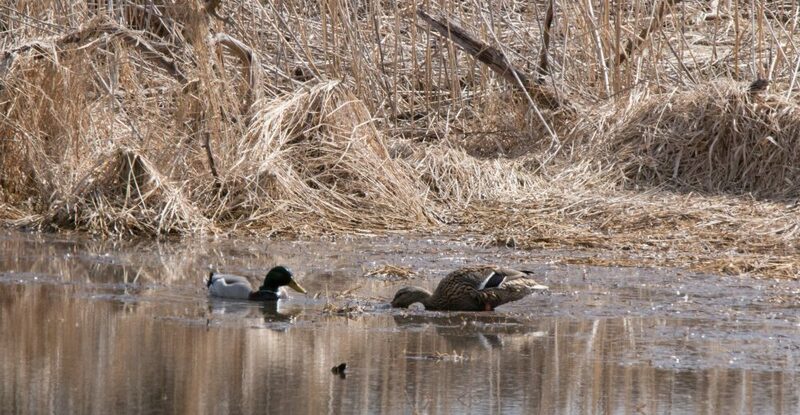 The easternmost normal occurrence of the Oregon in its winter range is Nebraska and its breeding range is in the northwest, so it’s considered rare in Illinois. There have been a couple other reports of other individuals locally. The American Goldfinches are coming into their breeding plumage slowly but steadily, some more advanced than others. I’ve been seeing mainly males at the feeders. One of my backyard robins put on a little fashion show using the new back gate as its catwalk. A little ray of sunshine: a goldfinch enjoying a drink of water. On the radio this morning I heard that this date last year, we were in the 80’s. Likely I was complaining about that. Oh well. We won’t be getting anywhere near that for a while, I suspect, but with any luck we are done with snow until – dare I say it – November.